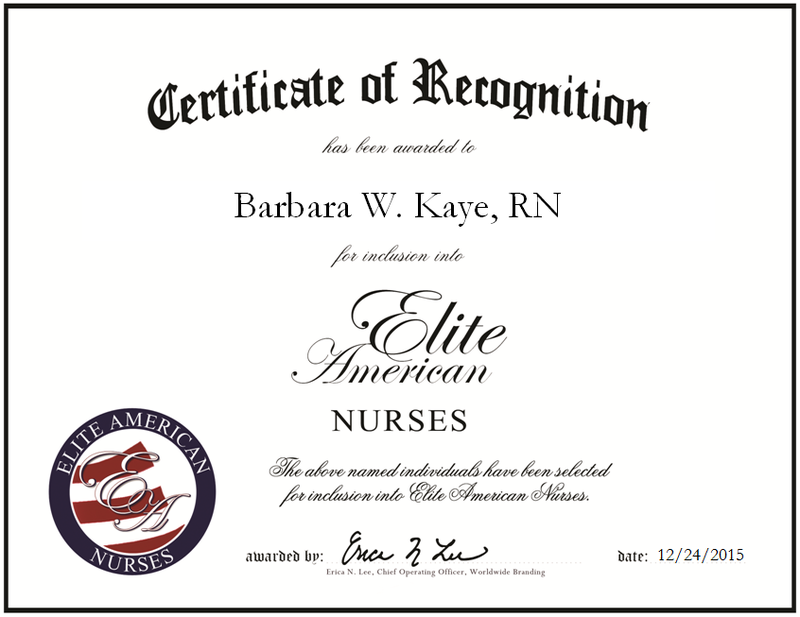 Charlotte, NC, December 24, 2015, Barbara W. Kaye, RN, Case Manager of the Home Health Department with the Personal Touch Care Team, has been recognized by Elite American Nurses for dedication, achievement and leadership in home health care. Ms. Kaye was inspired to join the medical profession by her best friend’s parents, both of whom worked in different areas of the health care industry; one was a doctor, and the other was a nurse. Ms. Kaye went on to earn an associate degree in nursing from California State University in Fresno, CA in 1954, and went on to lead a successful career as a registered nurse. With more than six decades of experience, Ms. Kaye is an expert in case management and patient care. Her wide array of responsibilities with Personal Touch Care Team include facilitating housekeeping for a staff of 100, overseeing a client base of 200, performing in-service training, educating patients and supervising home health aides for personal care. Her favorite business publications are “RN Magazine” and “Reader’s Digest,” both of which help her stay abreast of changes within the nursing and health care professions. When she isn’t providing top-notch services as a registered nurse and case manager, Ms. Kaye enjoys watching sports, especially football, and playing tennis. This entry was posted in case management, home health care and tagged case management, educating and training, health care agency, home health care, medical administration, patient care, supervisor. Bookmark the permalink.